“I Can’t Breathe” has become a popular rallying cry for activists around the country protesting the choke hold death of Staten Island, N.Y., father of six Eric Garner and police brutality in general. However, one Indiana cop is taking the phrase and transforming it to represent what he considers to be the other side of the story—the police perspective, WSBT 22 reports. 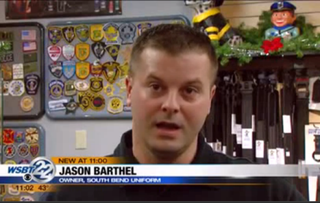 Jason Barthel, a Mishawaka police officer and the owner of South Bend Uniform, has created shirts bearing the slogan “Breathe easy, don’t break the law.” He told WSBT that the shirts were selling quickly, with more than 100 online orders already and phones continuing to ring off the hook. Barthel told WSBT that he was just trying to present the other side of the story and that there was a point to the phrase, which some are sure to find controversial. “We are not here to do anything negative to the public. We’re here to protect the public, and we want you to breathe easy knowing that the police are here to be with you and for you and protect you,” he told the station. Read more at WSBT 22 and Vocativ.